Having your teeth straightened as an adult can be a challenge. On one hand, you want your teeth to be straight, so you look your absolute best. On the other hand, wearing braces is anything but appealing to most adults. In order to let you achieve the straight teeth you desire and look great while you do it, Dr. Campbell and Dr. Schmidt, your Lake Forest Invisalign dentists, are pleased to offer you Invisalign to straighten teeth without unsightly braces. Invisalign is a revolutionary teeth straightening system that allows you to straighten smiles not only without traditional metal braces but while wearing comfortable and removable clear aligners that no one else will see. During your initial visit with the dentist, you will discuss what it is you’d like to achieve for your smile. If the dentist decides that Invisalign is a good option for you, he begins designing your Invisalign program. Impressions and images are taken of teeth, and they are used by dentists to create your custom treatment program. The dentist uses 3D images of your teeth to plan your tooth movements throughout the entire process that will get your smile to where you want it. From these plans, a series of custom aligners will be made just for you. 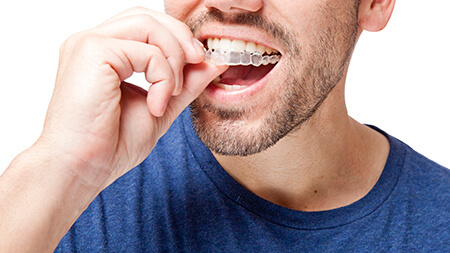 Once you receive your first set of clear aligners, you can begin wearing them right away. The way the program works is that you switch to the next set of aligners in your plan every couple of weeks as specified by the dentist. The aligners are designed to shift teeth gradually the same way that the tightening of traditional braces does, only with Invisalign there are no braces or rubber bands to deal with. The aligners should be worn at all times, but they can be removed for eating, drinking, and brushing your teeth. They are comfortable to wear, virtually invisible, and don’t disrupt your day-to-day life in any way. Because they are totally clear and removable, you and others are literally able to see your smile getting straighter and straighter every day! Invisalign allows adults to get the straight and beautiful smile that they have always dreamed of without the discomfort of unattractive metal braces. This means more and more adults are finally getting the smiles they want. Dr. Campbell and Dr. Schmidt understand the importance of a beautiful smile that you can be proud of, and they know that Invisalign can help you achieve that smile without having to endure a process that can be uncomfortable for an adult. Invisalign invisible braces help you to not only have a straighter smile but also offer an improved level of self-confidence — one that can only come from having a smile you’re proud to show off. If you would like to know more about Invisalign and all that it can do for you, then please contact the office to book your consultation and start on the road to the straight and beautiful smile you have always wanted.